You can tell a lot about someone's personality by analyzing their decisions, including their choice of seashells. Look at the three shells pictured here, and choose your favorite shell. Don't over-analyze it! Just pick the very first shell you are instantly attracted to. Find out what the shell you pick has to say about your personality by reading the explanations provided below. 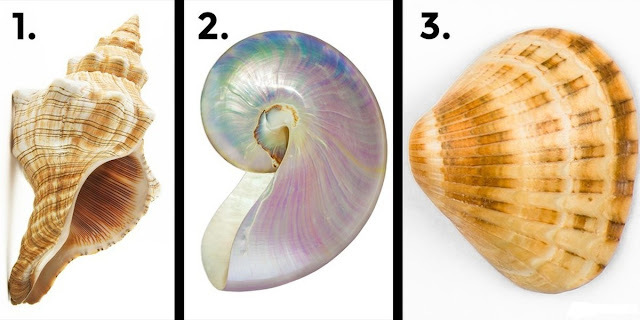 If you chose shell 1 you know what it is like to go through tough times and you are stronger and wiser because of it. You are strong, but you are also gentle and sensitive. You constantly seek out protection, such as the protective exterior offered by this shell. This shell is very symmetrical. If you chose this shell, you crave balance throughout your day-to-day life. As a borderline perfectionist, you like life to be simple and balanced, otherwise you tend to worry a lot. Keeping to-do-lists, and staying organized are all great traits, but don't forget to let loose now and then. This shell is smooth and shiny, but very closed off with sharp spines on the inside. If you chose this shell you may be holding onto something that does not serve you any longer. You also have trouble getting close to others. Let go of whatever it is that's holding you back and allow people to come into your life.